It's no fun to start your tiling project by cobbling together sub-standard tiling tools or trying to "make do" with tools that aren't really made for tiling. If you plan to take on a significant tiling job DIY (which I define as one or more rooms of wall or floor tile, but not partial tile projects like a tub surround or kitchen backsplash), it's definitely worth investing in these 9 tiling tools before you open that first bucket of thinset. Bite the bullet and do it: buy that wet tile saw before you start trying to cut your tile with maddeningly inferior tools such as a snap tile cutter. A wet tile saw zips right through ceramic, porcelain, and natural stone tile, reducing breakage. Downside is that a wet tile saw has no auxiliary use beyond cutting tile. So, when your tile project is done, it will likely gather cobwebs on a shelf. All that said, I strongly urge you to invest in a wet tile saw. Consumer-level tool manufacturers like Ryobi and Skil offer wet tile saws in the $100-$200 range. The term "grout float" is almost a misnomer. A float does anything but float. Once the tiles are applied, mortar is pressed into the seams between the tiles by, you guessed it, the grout float. It's like a trowel with a hard rubber base. 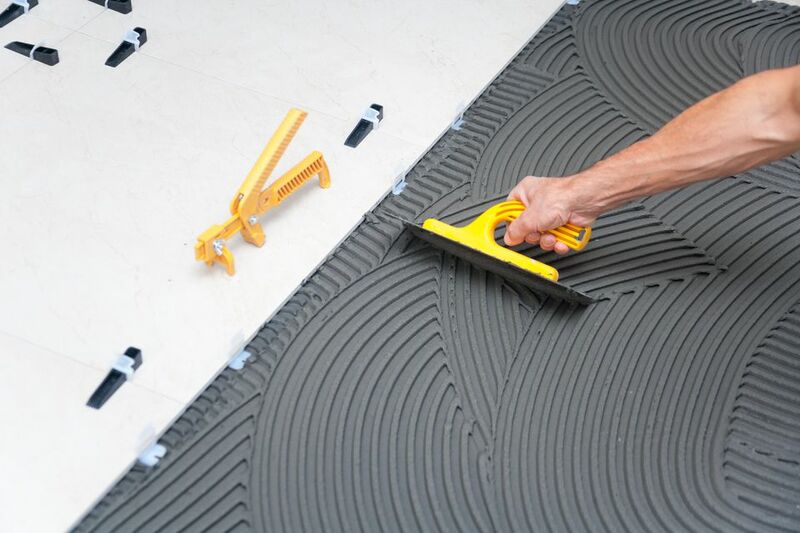 Indispensable: there is no substitute or improvisation for a grout float. Deceptive, because it looks like you wouldn't have to buy a grout sponge. After all, you've got scads of sponges laying around your house, right? Yet those sponges are hardly adequate for sloughing off lingering tile mortar. For that, you need a big, thick, dense-celled sponge. In other words, a grout sponge! This inexpensive tiling tool (sometimes called a tile nipper) helps you make irregular cuts (like semi-circles) that the wet tile saw cannot. It is possible to finish a tiling job without needing a tile nibbler, especially when the project has a lot of open space without obstructions like pipes. Tiling is about straight lines. And there is one old-school method of laying down a straight line that still works today: a chalk line. Fill the tool with chalk powder, shake it up, and unreel the string to the desired length. Snap the string as you would with a bow and arrow, and you get a legible, though hazy, blue line on your floor or wall. A chalk line is used to define the basic tiling area before tiling begins. If you have any kind of stocked workshop, you've already got a bubble (also called box) level. It's a ruler with two inset bubbles within green fluid: one for the horizontal, one for the vertical. Used for wall tiling only. A laser level can be used in place of both the chalk line and bubble level. Use the rubber mallet for gently tapping tile into place. Wrapping a hammer in something soft (fabric, foam, etc.) will not work. Invest the $15-$25 in a mallet and save yourself countless cracked tiles. Finally, you'll need a large, clean plastic bucket or two. This bucket needs to be new (not used for car washing, mopping, or anything). If you decide to make thinset mortar out of a dry, powdered base, you will need to do this in a large bucket. In any case, even if you buy pre-mixed thinset, you will need another bucket for sponging off grout.